Finding the Area Under a Circle Using Integrals? I'm assuming you'd have to use calculus as there is no way to simply subtract the area of the circle from the area of a larger rectangle without ending up looking for a limit. I guess I don't know how I'd go about finding the anti-derivative of a circle. A much simpler geometric (non calculus) method is to subtract the area of the minor segment of the circle from the area of the right triangle as shown in my diagram. The required area is area of ∆ABC - area BDCB. You are generous with upvotes, Sir. 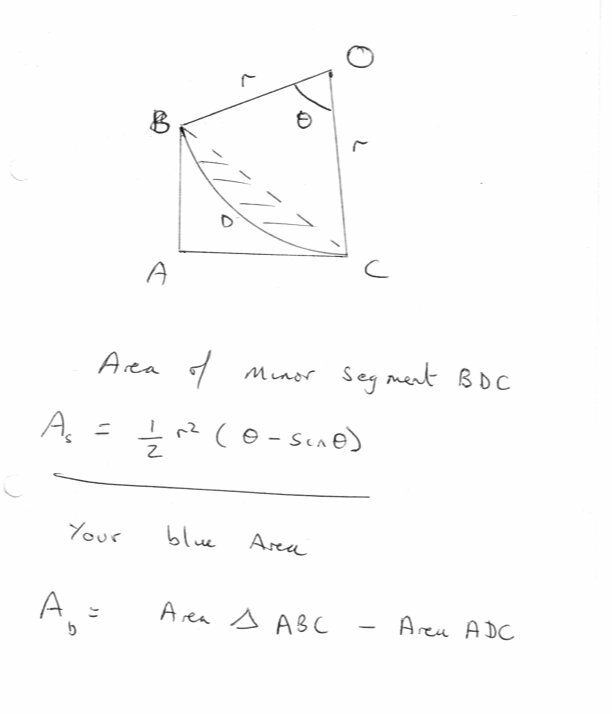 Not answering the question, about integrals, but solving the blue area question, one could take a geometric approach. The radius of circle is two units and its area can be calculated by pi r squared. The area of the square that encompasses the circle is 16. The difference between these two areas is the area that is within the square and outside the circle. One quarter of this difference is between the circle and the axis. Then, looking at this area you see three areas. One in blue, another the same shape as the blue invisible up agaist the y axis, and a third area which looks from the scale of the drawing, as if it might be a square, drawable as if .5 x and .5 y would be a point on the circle. If this is true, which we could check by seeing if the difference between the diagonal of a .5 by .5 square and a 2 by 2 square is 1, then the problem would be solved by taking away .25 from the area we figured is between the circle and the axis, and dividing the remainder by 2. I meant to say 2 not 1, as the radius is 2 and 2 , which is the portion of diagonal from 2,2 to the origin within the circle, would leave a certain distance between the circle and the origin, which would be equal to the hypotenuse of a .5,.5 right triangle. Actually, upon doing the check, its a .865 or so square, where the corner would be on the circle. So abandon my method. 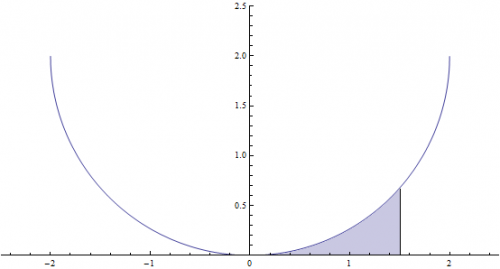 Although there still is an integral problem to do with my method concerning that area between .5 and .586. That .086 wide slice that runs up from the x axis to the circle is the difference between the blue area had the problem stated .586 and the blue area as it is at .5. And so if you were to solve the problem the geometric way, as if it had stated .586, you would be close to the correct answer and you would just have to add the area of this slice, which is mostly rectangular at .5 x .086, with just a little area left under the curve, that could be figured with integration. So anyway. Nevermind. My check did not work out. The square root of 8 is 2.8284, the square root of .5 squared plus .5 squared (.5) is .7071 and the difference between the two is 2.1213. Where we (I) needed it to be 2 for the method to work. Sorry again, my edit is not working right. I typed .865 and meant to type .586. I get about .3116 using my method. What do you get Daedalus? Studiot? metacogitans? This isn't a homework question, is it? What do you get Daedalus? 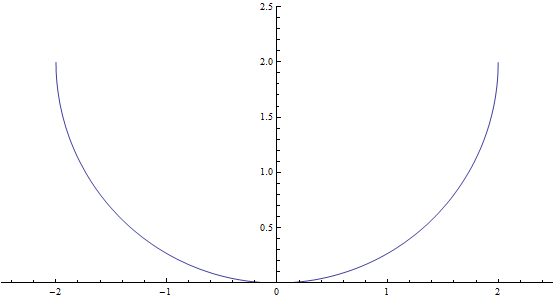 Using the integral, shifting the function as I did, and assuming a radius of 2, we end up with an interval [0, 1.5]. It is important to note that, even though the OP is integrating the left side of the circle, the symmetry of the function allows us to integrate either side as long as we adjust the limits of integration. So, the answer you got Tar is a good approximation. The pesky LaTex bug has struck again so here is a scan. Studiot, I think you messed up on the calculation because [math]4-\pi = 0.858407346410206... \ne 0.31171910038781636...[/math] . I see... My bad. I thought you were providing the answer for the region being integrated. 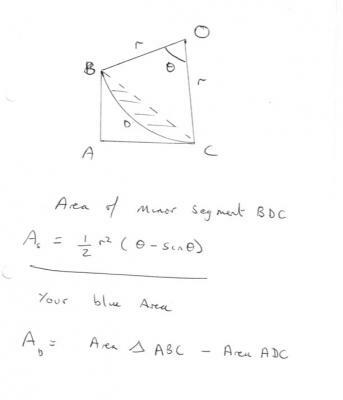 So anyway, what is your answer, by your triangle method, to the original blue area question? 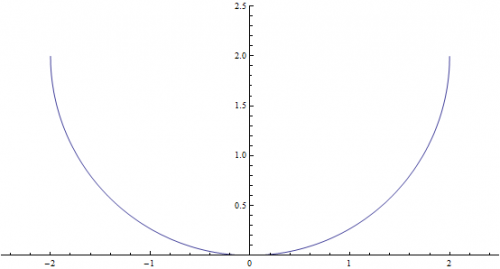 Daedalus already gave us the exact answer, that you get through integration, my approximation using my method was close, and would have needed integration to get to the exact answer because I still had the little peice under the curve that I just had to approximate. What number do you get with your triangle method? That is, does your method work to get an exact answer, or is integration the only way to go? No, I answered the general problem. 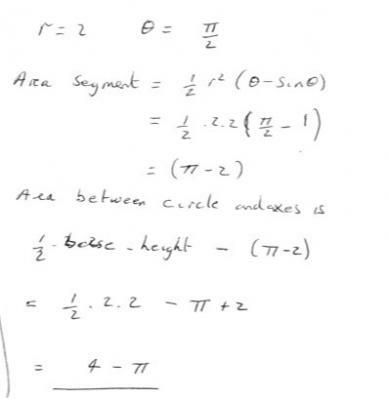 To specifically calculate metacogitans figures you need to calculate the value of y at x = 0.5, say Y, from the equation for the circle, to obtain a second side to the triangle. The angle subtended at the centre is then twice the angle whose tangent is given by Y/X , or you can obtain the centre angle by calculating the chord and then using the cosine rule. Solving for y leads to the two values, we want the lower or smaller one of 0.67712434. Thus the area of the segment is 2(0.848062-0.75) = 0.19724 area units. The difference is (0.507843 - 0.19724) = 0.311 area units. This method is accurate for all values and does not require calculus. Does this answer your question, Tar? Nice, I didn't get it the first time. So I hope that answers the OP.